A gripping historical drama, Woman in Gold travels between 1930s Austria and 1990s America. Based on a true story, the film centers around Gustav Klimt’s painting, Portrait of Adele Bloch-Bauer I. Austria looked at the portrait as a national treasure; Maria Altmann simply saw it as a picture of her aunt. Stolen from her family by the Nazis in 1938, the painting becomes the center of an international controversy in the late 90s when Altmann fights for the return of her family’s property. The present day legal battle is complemented by flashbacks to Maria’s childhood, her relationship with her beloved aunt, and her daring escape from a no-longer-safe Austria. 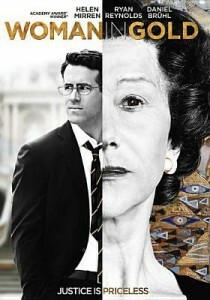 You’ll get drawn into the story starring Helen Mirren and Ryan Reynolds. And if you’re like me, you’ll wonder about the true events that inspired the movie: check out this book for what really happened. Join us on Thursday, September 17 at 2:00 p.m. We’re showing Woman is Gold as part of our Thursday Afternoon Movie series. Register here. So true! I found the history fascinating and wanted to learn more. Enjoyed this movie.